Merchandising Metrics is a consulting practice offering analytical and creative solutions to retail and wholesale brands that stretch beyond the scope of traditional thinking. We'll take you from present day to clarity...from options and opportunities to improved results...sales and margins and Brand Management. Optimism and good intentions are not the same as a well thought through strategy. PROBABILITY MERCHANDISING is a simple idea. How does a retailer, a wholesaler, a brand bend the odds in favor of both great brand story telling while also maximizing the profit potential of the business? Whether it’s called assortment planning, editing or more recently, curating, the process is an intricate interweaving of Left Brain + Right Brain thinking. It is truly Science + Art. It is Logic + Design. 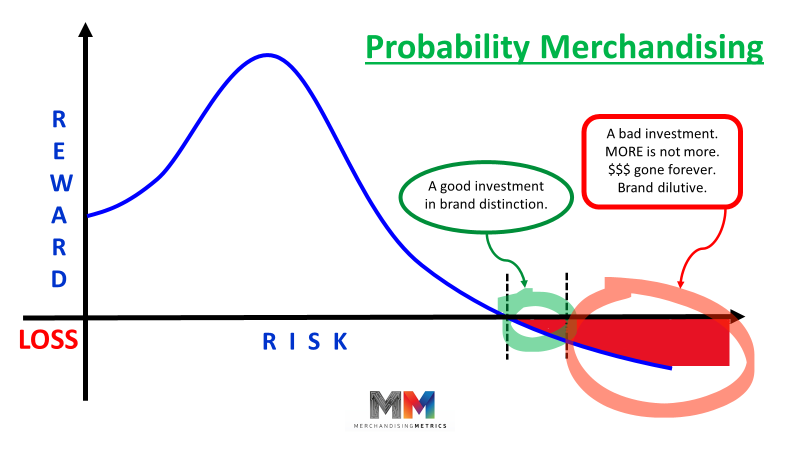 MERCHANDISING METRICS can show you the tools and teach you the thinking that will elevate your business. The process is rigorous. All the inputs, all the moving parts, all the variables are Pressure Tested and Filtered. Getting to 5R product is not just about Design. 5R = Right Product + Right Price + Right Place + Right Time + Right Quantity. Last year data, current trend, Risk Mitigation, Color Management, Climate and Seasonal Conversion all play a role. Left Brain + Right Brain = Merchandising Metrics.